The Upper Haight's newest tattoo parlor is Studio Kazoku, located inside a storefront at 1915 Page St. (between Shrader and Stanyan) that's gearing up for an opening at the end of this week. The studio is a new endeavor by local artist Jill Bonny, a specialist in Japanese-style tattoos who lives in the Sunset and has been practicing in the Bay Area for 18 years. After a few weeks spent clearing health inspections and doing a light, Japanese-inspired remodel--including burned cedar, rice paper panels and raw timber counter tops--Studio Kazoku is ready for business. The studio is Bonny's first--she was formerly with State of Grace in San Jose--and she's joined by artists Jonah Levin, Chris Wielk and Ryan Neri. Her personal expertise is in Japanese styles; in addition to working with clients, she also lectures and writes on Japanese art and tattooing. Despite her speciality, Bonny said "the shop works in many styles," including haikara microblading, a semi-permanent makeup technique. 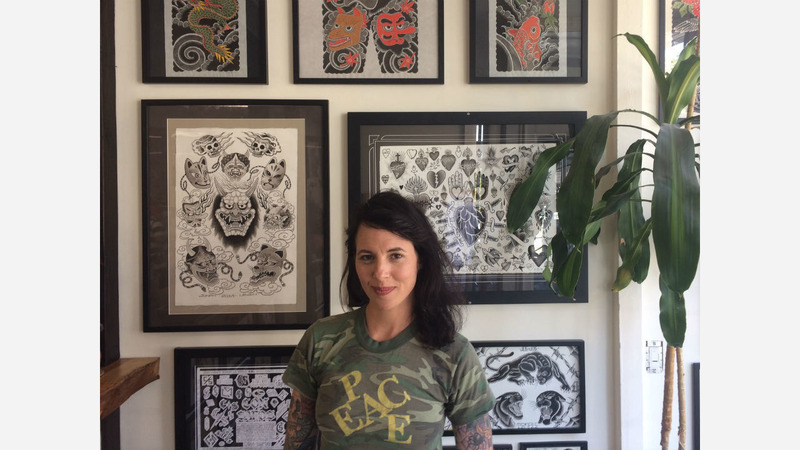 Bonny said she gravitated towards the neighborhood partly because of its existing community of tattoo shops and the wealth of nearby shops and amenities the Upper Haight offers clients, many of whom travel from out of town. "We really love our Haight Ashbury community," she said. "We're just so happy to be part of this community." Kazoku is Japanese for "family," she said: "We're trying to convey that sort of feeling." This weekend, Studio Kazoku will be open during the Haight Ashbury Street Fair on Sunday, June 10, where it will offer special merchandise, tattoo specials, and staff on hand to welcome new patrons. Studio Kazoku is open Tuesday through Sundayfrom noon to 7 p.m.